Fair Food – Springfest, State Fairgrounds, & More! One of my absolute favorite things about going to the fair that I still look forward as an adult going with my children is the incredible, and sometimes bizarre, food. 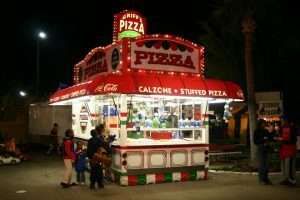 There is something about fairs that brings out the most creative of minds when it comes to cooking up the next hit at the fair and you will find meals cooked up that you have no chance of finding anywhere else. What I love about going to the fair is that you really never have any idea on what you might find. And there is absolutely no judgement when it comes to eating at these amazing places. You can find just about anything fried and the unhealthier it is usually means the tastier it is. This one is definitely a more common one that you might find around the country and I am a little embarrassed to admit, but fried twinkies are some of the most incredible things you could ever put in your mouth. I really am not into twinkies on their own either, but when you fry them up they are just a flavor explosion that is like nothing else. One of the more crazy ones that I have seen was a cheeseburger with all of the normal toppings but there is a catch. They do not use a regular hamburger bun. Can you guess what they could use? If you said crispy cream doughnuts then you are correct. This might not sound like something that would go well with a burger but I am telling you it will change your life.